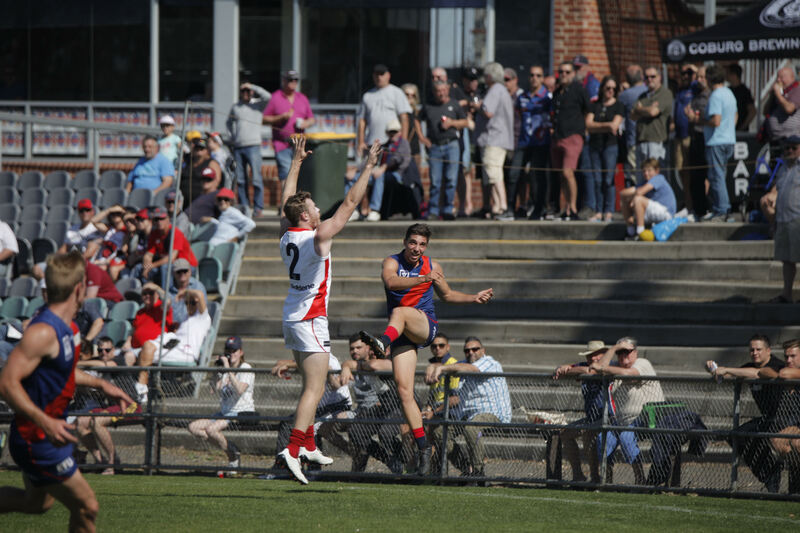 Coburg were on the wrong end of a 107-point margin in its opening game of the 2018 VFL season against Casey Demons. A Lions line up that featured nine debutants were up and about early, having all the play in the opening 10 minutes. Max Mitchell-Russell kicked the opener for the day with his first kick in VFL football, but other than that Coburg couldn’t translate its good play onto the scoreboard. Casey answered back with four goals in the next five minutes to take the lead, and was able to hold it for the remainder of the game. Lochlan Dickson was one of the shining lights in a defence that was under siege all day. 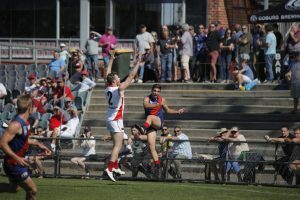 Dickson took 5 marks and had 16 disposals, while also leading the team in spoils, as he excited Coburg fans by taking the game on all day long. Ryan Exon was also another who stood tall in a defence that had to try and defend 68 Casey inside 50s. Marcus Lentini also stood out in his first game in the navy blue and red, picking up 23 disposals to go along with 14 contested possessions and 9 clearances. While the match ended in a comfortable win for Casey, there were plenty of signs that would please Coburg fans with a long season to come. The Lions never gave up and continued to take the game on at every possible opportunity with the pressure on the ball carrier a constant as the game wore on. Liam Hunt copped a knock early but returned to the field soon after and continued on from his impressive pre-season to finish with 23 disposals, 10 clearances and a goal. Talking post-game assistant coach Andrew ‘Sturg’ Sturgess said the young players now know what to expect at VFL level. “Playing against a strong Casey outfit, (the boys) got a taste of what it takes at this level and what the quality of players they will be going up against every week,” Sturgess said. While the clearances were close, Sturgess noted a distinct difference in the quality. “Their takeaways compared to ours were probably just a lot cleaner,” he said. Coburg will be eager to make amends next week when it travels to Footscray to take on the Bulldogs, with the game kicking off at 12pm on Saturday afternoon. Goals: Svarc 2, Mellington 2, Mitchell-Russell, Goodwin, Kerbatieh, Cannolo, Lentini, Hunt, Fox. Best: Exon, Dickson, Mellington, Lowson, Guthrie, Murphy.